Designing a child's bedroom is fairly simple, but designing a nursery – especially the first time round – is a whole different matter. It should be a fun project and, while you might like to indulge in a scheme that's very baby-centric, long-term thinking is a must because you (really) won't believe how fast they grow into the toddler stage – and past that. So, it really pays to plan for a decorating scheme, and the furniture that goes in it, that will last for – or at least need rethinking – five years. This level of planning will help your budget go further, and should help you avoid costly mistakes. Matt emulsion will create a flat finish. Look for wipe-clean versions rather than traditional matt paints to keep the walls in a good state for longer. If you want a finish that’s more resistant to marks and scuffs, opt for paints that can be scrubbed clean. Chalkboard paint can be a huge hit in toddlers’ rooms. Use it over a noticeboard-sized area, or even a whole wall. When it comes to colour, don't be lured into the boys = blue, girls = pink, not sure = yellow debate. Instead, choose a colour that will suit the room's orientation (north or east facing rooms will look more inviting with warmer shades; south and west facing rooms can take cooler tones); that will flatter its proportions (light colours being more space-enhancing than dark; dark colours being cosier at night than light ones); and that you actually like – your baby's not going to have a strong opinion for a good couple of years (hopefully). The upside to paint over wallpaper? Apart from helping keep the budget down, painted walls have the advantage of being relatively quick and easy to update in future. Bear in mind, though, that the darker the shade, the more coats you’re committing to for a colour swap. Don't want to be revamping every five years? A neutral paint colour for walls will give the room's scheme longevity and can make future room swaps quicker as the colour won’t need to be changed to suit the new occupant. You can also change the look of a neutrally decorated room quickly and cheaply with bedlinen and accessories. But don’t forget that pale shades – while a flexible backdrop for colourful accessories – are more easily marked, so cleaning, touch-ups and full-on re-decorating will be more frequent. Wallpaper is another route to giving a nursery personality. Many children’s wallpapers are bold and busy, so don’t feel obliged to use one on all four walls if it’s going to look overwhelming or make the room feel too small. Instead, try hanging it on a single wall or perhaps two. Don’t just think dedicated children’s wallpaper, either. Patterns including geometrics can look just right – and babies will love them. Murals are another eye-catching alternative. They work like a feature wall created with wallpaper, but you can size the design (rather than working with standard rolls of wallpaper and pattern matching). Themes include animals, birds, maps and charts, astronomy or architecture, as well as patterns. Simpler to use, wall stickers can add interest to children’s rooms, and are easy to remove when they tire of the design. There are versions available to please kids from nursery age to sophisticated teens, so don’t just consider them for little ones. Be bold in scale, either with a single image or in creating a group as they’ll tend to look lost otherwise. Carpet is warm and comfortable underfoot, to lie the baby on while you're changing him/her and to sit on. It will cushion falls when they start to toddle and is forgiving when items are dropped on it. It can also provide effective noise insulation – useful if your baby is sensitive to sounds when it's going off to sleep. On the downside, carpet can get stained so spills should be blotted immediately then gently cleaned. Polypropylene is dirt and stain resistant and often marketed for children's rooms, but an 80 per cent wool and 20 per cent manmade fibre carpet is durable, moisture and dirt-resistant, so don’t rule it out if you prefer to boost the natural element. If you discover your child suffers from allergies, carpet is not recommended – try one of the hard flooring options below instead. Vinyl flooring that’s good quality is warm, hard wearing, easy to clean and forgiving as a surface. It’s available in brilliant colours, if you want to make the floor the focus, as well as more subtle shades, or opt for the neutrality of a wood-look vinyl. Rubber flooring is a practical and good looking option for babies’ rooms. It’s soft and comfortable and a really durable surface that’s easy to keep clean. It also provides good noise insulation. There’s a wide choice of colours. Laminate is a functional flooring alternative for a baby’s bedroom. A good quality version will stand up to wear and tear, and is easy to look after. Wood is natural and easy to keep clean. Solid wood and good quality engineered wood floors can be sanded and refinished if marks are made, so last for many years, and timber will continue to look good while other room elements change. Although wood has some shock absorbance, it won’t match carpet for this and will be more noisy. If you pick either a hard flooring option like wood or laminate for a baby’s room, or want to brighten up a plainly carpeted floor, layer a rug on top. Flat weave or short pile rugs are easiest to keep clean and both wool and cotton are soft and durable. Whichever type of rug you choose it’s vital to make sure it isn’t going to slip. Underlays and grips designed for the purpose will prevent accidents. Children’s room rug designs range from the themed (which might only be a hit for a very short time) through traditional motifs like stripes, spots and stars, to plain blocks of colour that won’t get into competition with patterned wallpaper. Once again, if making the decor last and the budget go further is key, the more classic the design, the better. Shutters are a popular choice. Solid shutters are very effective at keeping daylight out to prevent sleep disruption, making them a particularly strong contender for a place in nurseries. They’re available painted as well as in wood finishes. Both these or slatted shutters will look good and last for years to come. Blinds are functional, too. Choose black-out blinds to block light effectively or go for a more decorative fabric with a black-out lining. Venetians offer good light control and can help avoid glare on screens. Blinds that operate on a spring or are motorised are designed to be child safe, as are those with breakaway cords. Otherwise, fit a separate safety device to keep the cord out of the way. Curtains bring the soft drape of fabric to a room and can introduce a touch of colour or pattern. Cleaning will be more time-consuming than that required for shutters or non-fabric blinds, however. Blackout lining is available, but it won’t block out all of the light, so team with a black-out blind to make the room darker. Just as in other rooms, nurseries should have a range of light sources for flexibility. Ambient light for the room is usually provided by a ceiling pendant, down lights or track lighting. You might want to hang a pendant with an attractive shape (to throw interesting patterned shadows), or in a beautiful colour. If the design leaves the room without adequate all-over light, supplement with down lights. A table lamp with a dimmer switch will need to offer different functions at different stages. For babies and younger children, a nightlight can provide a comforting glow – and allow you to move about the room at night without disturbing them. For when they're older and enjoy you reading to them, a bedside lamp that’s bright enough to avoid eyestrain is vital. Decorative lighting can be a great way to personalise a scheme. Fairy lights around a window or plug-in LED strips are low-cost ways to keep up with changing tastes – just ensure they're well out of the way of little hands. Check out our selection of the best kids’ bedroom lamps. If you're buying your cot separately to the baby's mattress, check you have the right size; standard sized cot mattresses are a little narrower than cots designed for Continental size mattresses. The bigger the cot (and the more adaptable), the longer it will last. Does the cot have removable sides? This is handy if you want to push it (with one open side) against your bed while you're night-feeding; it can then be transferred to the nursery with all four sides attached; later, when your baby becomes a toddler, it can be converted into a cot bed. Bear in mind that purpose-made cot beds tend to be larger than cots. Removable sides aren't the same as drop sides; to ensure the cot you choose has drop sides that are safe, ensure they conform to BS EN 716: 2005. Is the base height-adjustable? As your baby grows you'll want to lower it so that he/she can't climb out; height adjustment means you can line up the baby's mattress with yours while the cot is at the side of your bed. A teething rail is a good idea; this protective covering on the edges of the cot will get a good chewing by a teething child, but won't show damage. Wheels are a handy feature if you'll be regularly moving the cot from one room to another. When you're buying a cot, consider the next bed option you'll buy – doing so will help you choose the right sized furniture for the rest of the room so that you don't have to refurnish when you upscale the baby's bed. Toddler beds are practical because they’re low to make climbing in easy, and are designed to prevent kids rolling out. After that, it’s down to aesthetics with a choice between more whimsical offerings and plainer wood or wood-look designs. Extendable beds are sized for toddlers but pull out to keep up with growth, so they’ll fit for longer. Full-size single beds will be practical for many years (and handy as a guest bed after that). Guard rails can be added to avoid rolling out. Consider a design that incorporates a pull-out under bed for sleepovers to save space. Bunk beds are space-saving for room sharers, or ready for sleepovers if the room has just one occupant. Top bunks should be reserved for the over sixes and the mattress shouldn’t be so thick that it allows them to roll over the barrier. The ladder should be securely fastened, too. Storage beds include those with built-in drawers and roll-out containers underneath as well as raised beds with matching chests of drawers and shelving below. Also consider an ottoman-style bed with capacious storage that can be accessed by lifting the mattress for older children. Day beds are designed in sofa style with a support along one side as well as a headboard and footboard so they’re a comfortable place to sit during the day as well as a sleep space. Some have built-in storage, too. Mattresses should provide adequate support and keep up with their growth. Like adult mattresses even if it still fits, it’s important to change the mattress around every seven years so it continues to do the job it should. Make sure it’s compatible with the bed whether it’s a divan or a frame design if you’re purchasing the two separately. For little ones, don't forget waterproof mattress protectors, too, and dress up a new bed with our selection of fabulous children’s bedsheets and duvet covers. The changing table may not get used as much as you think – you may not imagine it now, but you'll find it easier to use a changing mat on your best living room carpet than climb the stairs to the baby's room. So, pick one that can easily convert into a standard chest of drawers or shelves once the baby's out of nappies. Whatever you choose, ensure it has built-in storage. One of the must-have pieces of kit is a nursing chair for both day and night feeds, although you may prefer to put this in your bedroom or perhaps even the living room. For longevity, choose one that's designed-for-purpose and looks the part to fit with your baby's new room scheme. Check out our pick of the best nursing chairs. Shelves are more useful than hanging space in wardrobes for babies, but choose a design that allows the insertion of a rail later. If you’re short on floor space, look for a wardrobe that incorporates drawers and a hanging rail in one piece of furniture. A painted finish can make a wardrobe or chest a bold focal point for a nursery, and is easy to update with a neutral colour in a few years’ time. 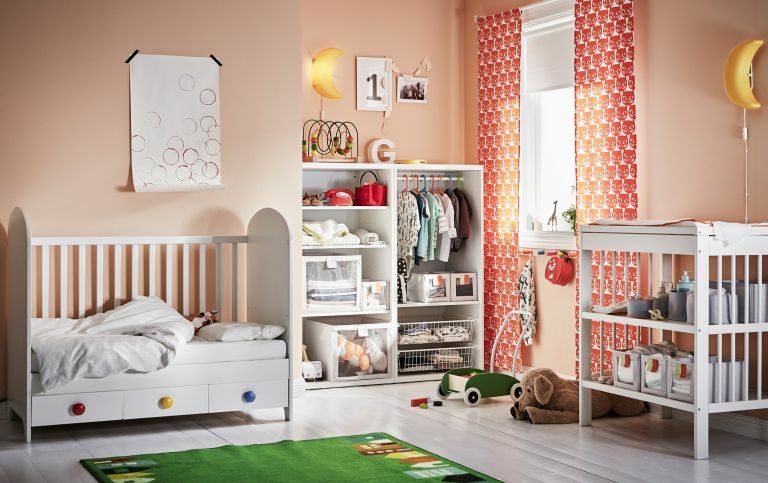 Maximise storage opportunities with wall-hung shelves and storage boxes that slide beneath the cot or changing table. Always ensure anything tall or heavy is fixed to the wall behind so that an adventurous toddler can't pull it over. Find our pick of the best nursery storage furniture in our guide. Nursery storage needs lots of forethought, whether you're thinking toy storage or clothes' storage. Adjustable shelving is a must-have for a successful child’s room design. That way it can adapt from nappies and wipes to toys. It needs to be safely fixed to the wall and accessible, of course – anything unreachable won’t be used. A mixture of open and closed storage is best. It’s important they can have favourites on show at every age, but being able to shut the door on stuff that’s used less frequently will help keep the room more ordered. Modular furniture is a good idea as new units can be added as collections grow. Chests are useful for medium to larger toys when they’re little, and anything from out-of-season clothes or bedding. They double as seating, too – add a seat pad for comfort. Alternatively try a specifically designed window seat with a lift-up lid, or an upholstered storage ottoman. For toddlers' rooms (it won't be long, we promise! ), easily moved bins (perhaps with castors) and baskets will help you sweep the clutter off the floor and out of the way swiftly. Transparent drawers will help toddlers find the toys they’re looking for more quickly and encourage independence. In the future, you might buy your children bunk beds or two single beds to share, but for now, picking a cot that's in the same material – or at least the same colour – as your older child's bed, and attempting to match bedlinen if possible, will make the room's scheme feel cohesive. For a more substantial division between areas of the room put up a half wall or use modular shelving (fixed to the wall or floor), or screens as separation. Consider different decor styles in each half. Colours can be complementary while creating distinct looks.